This story is not as straightforward as it seems. Changing water into wine at the marriage feast of Cana was Jesus’ first miracle. But he transformed himself as well: from an anonymous Galilean scholar into the man who would be Messiah. Cana, where Jesus performed his first miracle at a village marriage feast, was about three days’ journey on foot from the place where John the Baptist was preaching, and where Jesus was baptised. It was the scene of Jesus’ first miracle. It happened at a wedding to which Jesus, his mother Mary and some of Jesus’ disciples were invited. Mary seems to have been the reason for the invitation: the gospel text says that Mary was there, and Jesus and some of his disciples had also been invited. Mary was the main guest; Jesus and the disciples were tag-alongs. The wedding would have been a lively affair. 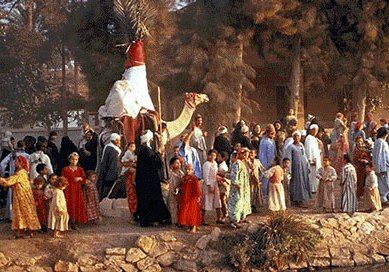 It was a village wedding, so everyone knew everyone else. Unfortunately we know nothing about the bride and groom. Perhaps they were relatives of Mary’s. It would be embarrassing to run out of alcohol at a wedding reception you were hosting. But remember that this story took place in the Middle East, in an ancient peasant household. There, it was a disaster. It was a gross discourtesy and a shameful humiliation to have to admit that you had not provided enough wine for the guests who came to a marriage feast at your house. Mary knew this only too well. She may even have experienced something similar in her own life, or in the lives of villagers from Nazareth. She was immediately sympathetic to the plight of her host, and wanted to help in whatever way she could. The first way to help was, of course, to be discreet. The less people knew about the dilemma, the better. The second was to remedy the situation. Mary approached Jesus. Help them, she said. 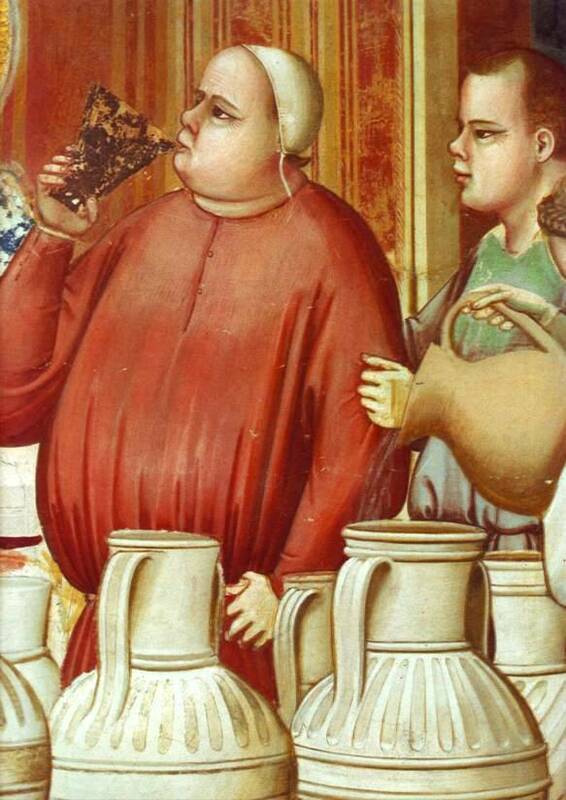 Giotto, detail from ‘The Marriage Feast at Cana’. Mary may merely have been prompting her son to do something to help in this crisis – like getting more wine from someone or some house nearby. It may be that guests, especially if they were close friends or relatives, brought along food and drink to supplement what the host provided. But if so, what did Jesus mean when he said that his time has not yet come? Whatever the reason, Mary succeeded in nudging Jesus into activity. She was the traditional Jewish mother, unwilling to let her child remain inactive. She simply told the servants to do whatever Jesus told them. There were six large stone water jars nearby. 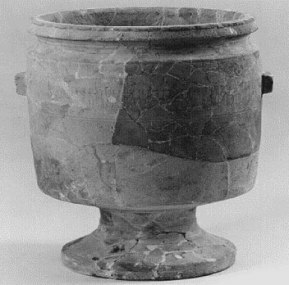 These were used for ceremonial washing – stone did not absorb impurities like clay, and so stone jars were used to store water was needed for ritual washing before a meal. They were apparently empty, the water in them used up by the many guests. Jesus told the servants to fill six stone jars full of water, and they did so. Then he told them to scoop some of the water out and take it to the man in charge of the wedding. This they also did. 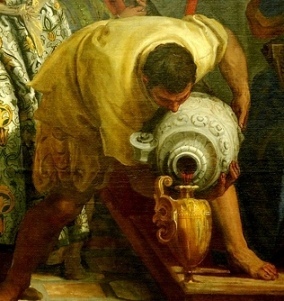 The Wedding at Cana, detail of servant with water jar, by VeroneseWhen the steward tasted the water, now turned into wine, he was impressed – not by the miracle, because he did not know about that, but by the quality of the wine. This, you will remember, was on the third day of the wedding, and people had been drinking for three solid days. Usually the host would arrange for the best wine to be put out first; at that stage, people were cold sober, and could assess the quality of the wine. Now it seemed that this custom had been ignored. Instead, the steward tasted high quality wine, something he did not expect at this stage of the wedding festivities. Whether he ever found out the truth, we do not know. It is at this moment that Jesus first allows the people around him to see what he really is: the Messiah, long-awaited and now here at last. The water is the past. He is the wine, the promised future. John 2:1-11 1 On the third day there was a marriage at Cana in Galilee, and the mother of Jesus was there; 2 Jesus also was invited to the marriage, with his disciples. 6 Now six stone jars were standing there, for the Jewish rites of purification, each holding twenty or thirty gallons. 7 Jesus said to them, “Fill the jars with water.” And they filled them up to the brim. 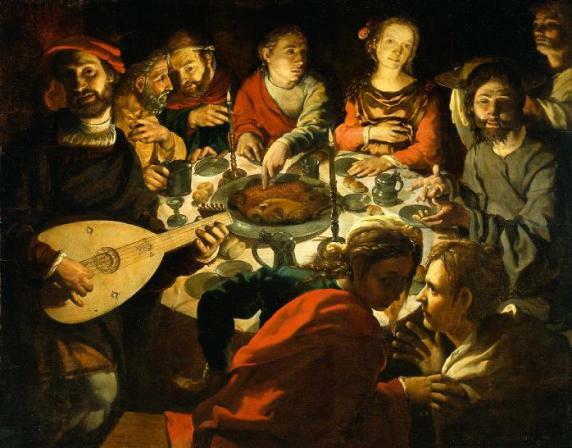 8 He said to them, “Now draw some out, and take it to the steward of the feast.” So they took it. 9 When the steward of the feast tasted the water now become wine, and did not know where it came from (though the servants who had drawn the water knew), the steward of the feast called the bridegroom 10 and said to him, “Every man serves the good wine first; and when men have drunk freely, then the poor wine; but you have kept the good wine until now.” 11 This, the first of his signs, Jesus did at Cana in Galilee, and manifested his glory; and his disciples believed in him.